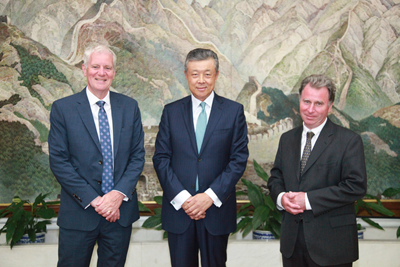 On July 11, Ambassador Liu Xiaoming met at the embassy with Sir Oliver Letwin, former Chancellor of the Duchy of Lancaster and the new honorary Vice President of the Great Britain-China Center (GBCC). GBCC Chairman Sir Martin Davidson was present. Ambassador Liu congratulated Letwin on his becoming GBCC's honorary Vice President, and spoke highly of the contributions that he has made to China-UK relations. Ambassador Liu said that a few days ago, President Xi Jinping had a fruitful meeting with British Prime Minister Theresa May during the G20 Summit in Hamburg. Both sides reiterated their adherence to the general trend of the "Golden Era" of bilateral relations and reached a new and important consensus on the development of China-UK relations. He hoped that GBCC could continue to give play to its strength to seize the new opportunities for the development of bilateral relations and make new contributions to the exchanges and dialogue between Chinese and British political parties, the judiciary, youth and in other fields. Letwin briefed the Ambassador on GBCC's plan for exchanges and cooperation with China in the near future. He said that GBCC is willing to work with its Chinese partners to raise the level of dialogues, explore new approaches to cooperation and promote the "Golden Era" in UK-China relations to bear more fruitful outcomes. Founded in 1974, the Great Britain-China Centre is a quasi-government agency affiliated with the British Foreign and Commonwealth Office. It aims to promote the dialogue and exchanges between China and Britain in political parties, justice and youth, and enhance the mutual understanding and trust between the two countries.